PlantVillage is built on the premise that all knowledge that helps people grow food should be openly accessible to anyone on the planet. We depend on edible plants just as we depend on oxygen. Without crops, there is no food, and without food, there is no life. It's no accident that human civilization began to thrive with the invention of agriculture. Today, modern technology allows us to grow crops in quantities necessary for a steady food supply for billions of people. But diseases remain a major threat to this supply, and a large fraction of crops are lost each year to diseases. The situation is particularly dire for the 500 million smallholder farmers around the globe, whose livelihoods depend on their crops doing well. In Africa alone, 80% of the agricultural output comes from smallholder farmers. With billions of smartphones around the globe, wouldn't it be great if the smartphone could be turned into a disease diagnostics tool, recognizing diseases from images it captures with its camera? This challenge is the first of many steps turning this vision into a reality. PlantVillage is a not-for-profit project by Penn State University in the US and EPFL in Switzerland. 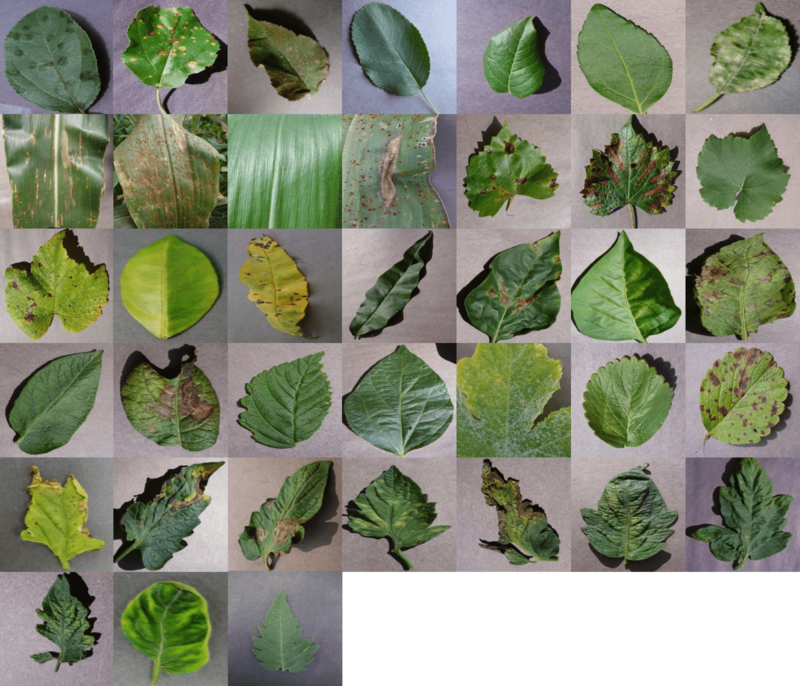 We have collected - and continue to collect - tens of thousands of images of diseased and healthy crops. The goal of this challenge is to develop algorithms than can accurately diagnose a disease based on an image. To learn more about the background of the dataset, please refer to the following paper: http://arxiv.org/abs/1511.08060. You must cite this paper if you use the dataset. Then finally the Mean of all the F1 scores across all the classes is used for come up with the combined Mean F1 score. y ij is a boolean value representing if the i-th instance in the test set belongs to the j-th label. p ij is the probability according to your submission that the i-th instance may belong to the j-th label. Ln is the natural logarithmic function. Participants are allowed a maximum of five submissions each 24 hours. Use of any external datasets (or any pre-trained trained models) in any form is not allowed. All images are released under the Creative Commons Attribution-ShareAlike 3.0 Unported (CC BY-SA 3.0) license, with the clarification that algorithms trained on the data fall under the same license. In order to be eligible for the winner's prize, you must release the source code used to generate the winning submission on a public GitHub repository, licensed under the Creative Commons Attribution-ShareAlike 3.0 Unported license. crowdAI reserves the right to modify challenge rules as required. The author of the most highly ranked submission will be invited to the crowdAI winner's symposium at EPFL in Switzerland on January 30/31, 2017. The educational award is given to the participant with the either the most insightful submission posts, or the best tutorial - the recipient of this award will also be invited to the symposium (the crowdAI team will pick the recipient of this award). Expenses for travel and accommodation are covered by crowdAI.